Washington - The hunt for potential life in outer space has taken a step forward - an international team of researchers has discovered the first Earth-sized planet within the "habitable zone" of another star. The exoplanet dubbed Kepler-186f was first spotted by scientists using Nasa's Kepler telescope, according to research published on Thursday in the US journal Science. "What makes this finding particularly compelling is that this Earth-sized planet, one of five orbiting this star, which is cooler than the Sun, resides in a temperate region where water could exist in liquid form," said Elisa Quintana of the Seti Institute at Nasa's Ames Research Centre in California, the lead author of the paper published in Science. 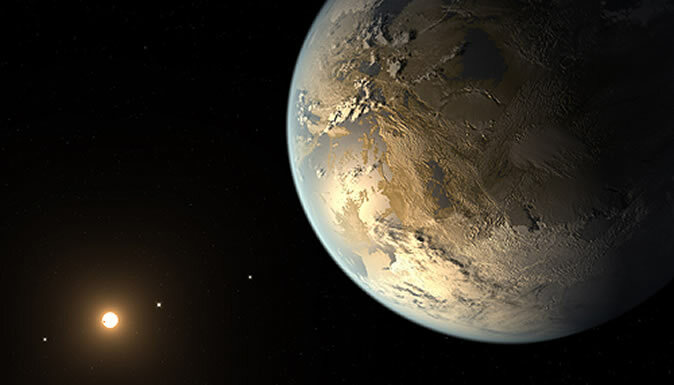 Kepler-186f is around 1.1-times the size of Earth - which researchers say is key to predicting the composition of the surface and its atmosphere. Scientists using the Nasa's Kepler telescope first discovered it by tracking "transits" - shadows that cross in front of the star. The finding was confirmed by observations from the WM Keck and Gemini Observatories. "The discovery of planets with Earth-like properties is one important link in the chain required to answer" whether life can exist on other planets, said co-author Fred Adams, an astronomer at the University of Michigan. "And the discovery of the planet Kepler-186f is an important step toward finding a planet that is like our Earth," he added. Because its star is so dim, Kepler-186f may not be suitable for follow-up studies to determine its composition, explained Quintana. "However, our research tells us that we should be able to find planets around bright stars that will be ideal targets to observe" with telescopes like Nasa's Webb orbiting telescope, currently under construction, she said. Of nearly 1 800 planets detected over the past 20 years, only around 20 orbit within the so-called "habitable zone" - and all appear to be larger than Earth, which makes it harder to tell whether or not they are gas giants. The Kepler space telescope, launched in March 2009, observes some 150 000 stars, a few thousand of which have been found to have possible planets.